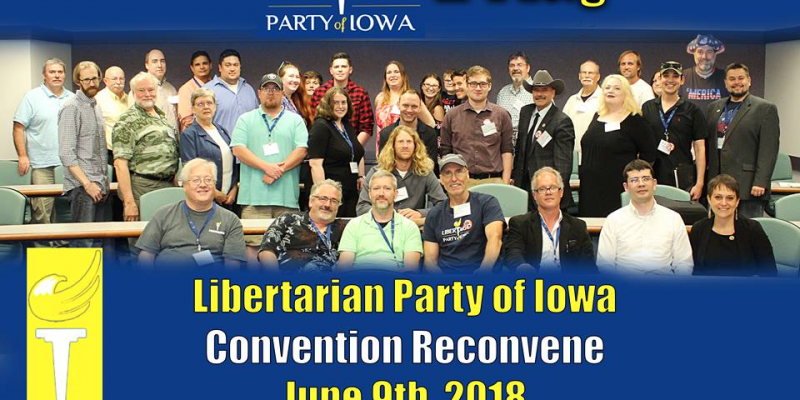 Newton, Iowa – The Libertarian Party of Iowa (LPIA) reconvened its state convention this past Saturday, June 9th, at the DMACC Newton Campus auditorium, with our state delegates determining our Lieutenant Governor nominee and other statewide ballot vacancy nominations. Additionally the LPIA Congressional District 1 and District 2 conventions reconvened to determine their respective candidates for United States Representative. Lieutenant Governor: Lynne Gentry of Rockwell City will join LPIA gubernatorial nominee Jake Porter at the top of our ticket. Lynne is a retired educator and former candidate for Iowa House, additionally she has served on the LPIA State Central Committee and is a longtime party activist. Secretary of State: Jules Ofenbakh, West Des Moines attorney. Jules is currently an officer of the LPIA State Central Committee. Ofenbakh will bring a business law background to the race and is an advocate for voter access as an immigrant to the United States from Russia. Attorney General: Marco Battaglia, Des Moines independent journalist and musician. Marco contended for the LPIA nomination for governor, participating at forums and debates statewide. Marco was Communications Director in Iowa for the Johnson/Weld Presidential campaign and a longtime libertarian advocate. Secretary of Agriculture: Rick Stewart, Cedar Rapids, will bring his passion for agricultural freedom and free markets to this race. Rick was a candidate for Linn County Sheriff in 2016 on the Libertarian ticket and ran as an independent for United States Senate in 2014, visiting all 99 counties on his bicycle your. Auditor of State: Fred Perryman, Cedar Falls sales manager, will bring his private sector leadership experience into the race. Fred is an alternate representative for District 1 on the LPIA State Central Committee. Treasurer of State: Timothy Hird, Des Moines engineer, will represent the Libertarian ticket. Tim is stalwart party activist and longtime treasurer of the LPIA State Central Committee until 2016. Additionally we are pleased to announce our District 1 and District 2 United States Representative nominees. For the first time in party history, all of Iowa’s congressional districts will have a Libertarian on the ballot, giving all Iowans a Libertarian choice at the ballot. District 1: Troy Hageman, Calmar Libertarian activist. Troy was the Libertarian nominee in 2016 for Iowa State Senate District and will bring his campaign experience to this race. District 2: Mark Strauss, Bettendorf businessman and sales leader. Mark will bring his leadership experience and passion for limited government and transparency to the race. Mark hitched up his boat in Iowa and joined the “Cajun Navy” in Houston following Hurricane Harvey as a volunteer, assisting with search and rescue. Additionally, as Keystone Speaker for the event, Libertarian gubernatorial nominee Jake Porter laid out his vision for the 2018 Iowa Governor’s race and his plan to support and grow Libertarian organizations and campaigns locally. Plus: Watch socialists try to rationalize Bernie Sanders' wealth. Wikileaks says they have a new 88 gig file to release..
Wasnt he arrested for sexual assault? Protect him mr president. Send security. It's time for them to dump every file they haven't released. I just can't believe there are Americans that side with the government here. He did nothing but bring the truth to light. Annual exoneration report shows growth in amount of time served and increasing levels of official misconduct. Sure we need to get better, but at the same time we also need to stop using large numbers in headlines to get attention without also showing the denominator. Here is a related question. It is going to take more than remedying the false convictions to stop the problem of jail overcrowding. I know legalizing marajuana and pardoning the possession prisoners would make a dent, but what other ideas do we have?